As I arrived at the track I was greeted with Richard Wilson’s car being push started and loud banging noises emanating from the exhaust. It was going to be one of those days. It turns out he had been practicing all day yesterday, and found out that his newly build engine had so much power the block could no longer contain it, and had let go exploding bits out of both sites and out the bottom. The night had been spent fitting a spare Michael P had given him. Unfortunately there was no start motor so push starts were required. I then spend the rest of the morning trying to help start the car and missed all of practice. Unfortunately we never got the car running and Richard never made any racing that day. Race 1 was before lunch, the sun was still shining and as I walked down the pit lane I was greeted by big smiles as everyone was keen to get out for the first race. The biggest smile being from Paul Eales, who after a winter rebuilt has found additional pace and was on pole for class A. As the race started Andy Young made his expected get away, both the MGC’s of Andy and Rob made a quick getaway and left the rest of the field behind for the rest of the race. Tom Diment, new to our series this year, lost a couple of places off the start line, and then slowly made his way up through the field and finish a gradable 3rd overall and 3rd in class, knocking a second off of his qualifying time. Class A saw a dominate drive by Paul Eales. Paul was chasing Alan Broke in the Class C metro, and got past by lap 6, with Alan slowly slipping back after this to finish 6th overall and 4th in class. Meanwhile James Walpole in class A continued to chase Paul. And his persistence paid off as Paul spun out on lap 10 handing the lead over to James. Paul soon got going and only lost the one place and set about catching James back up. With 2 lap to go Paul took the lead for class A from James on main straight to take a well-deserved win. Further down the grid in class A, Clive drove a strong race, but did not quite have the pace to keep up with Paul and James and took 3rd in class. 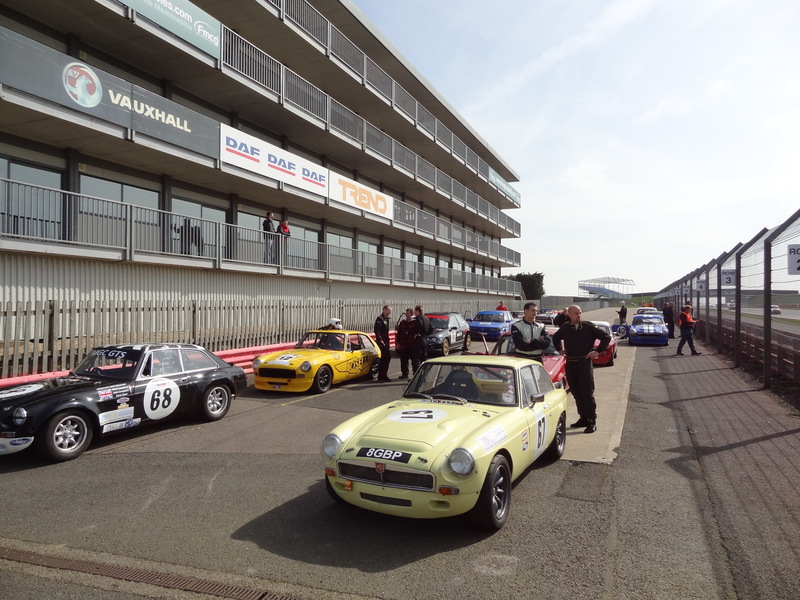 Davis Strike and Nick Arden had an epic battle for 4th in class, with Dave being the ultimate winner. However I lost count of the number of times that they changed position on the track. The honour of last spot was taken by Kevin Hewer, test driving a metro for Hannah. The whole car costing less than his replacement engine!. Both Kevin and Michael Piggot kept the crowd entertained. I don’t know who was driving Michael’s car, as it was locking up the brakes and lifting wheels. Overall an excellent race to watch from the grandstand, and all drivers receiving much applause from the crowds. This entry was posted in News & Reports, Posts on April 2, 2014 by Jonesey.